Do you love buffalo sauce? I do! 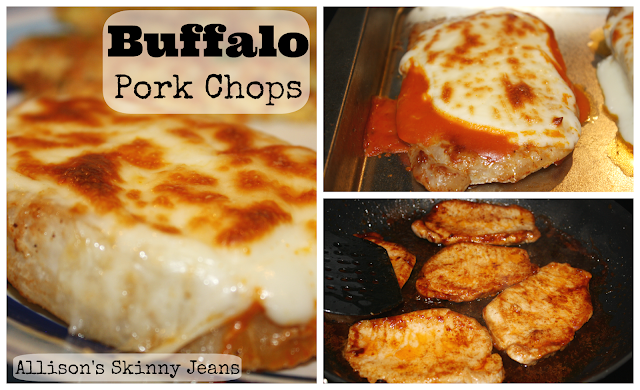 I was over at Sweet Bella Roos for her weekly linky party, and I saw her awesome recipe for these buffalo style pork chops. Our friends came over and we all worked together to make these, along with baked green tomatoes and zucchini fries. It was an amazing dinner with great friends! We weren't sure everyone would like the buffalo sauce (even though they didn't turn out too spicy), so we made half of them with BBQ sauce. 1. Season both sides of your pork chops with salt & pepper. 2. Heat the olive oil, butter, and wing sauce (or BBQ) together in a large skillet on medium high. We did 2 skillets - one with buffalo and one with BBQ. 3. After the mixture is heated, add the pork chops. Cook for a few minutes on each side until done. These are the pork chops with the buffalo sauce. These are the pork chops with the BBQ sauce. 4. After the pork chops are cooked, place them on a cookie sheet. (Cover the cookie sheet with aluminum for easier clean up.) Coat the pork chops with additional buffalo or BBQ sauce. 5. Top each pork chop with a thin slice of mozzarella. Broil on high for about 5 minutes, or until the cheese is melted. These came out wonderfully! Everyone enjoyed them - it's definitely a keeper recipe! Oh yum! Another gotta try recipe. Thanks for sharing. Definitely have to try this! It looks wonderful! It's hard to find new pork recipes that are actually appetizing. I agree - there are tons of chicken recipes, but not a lot of pork chop ones. Let me know how you like it! These look so yummy with all that lovely melted mozzarella. Thank you for sharing it at What We Accomplished Wednesdays. Have a great weekend! So glad you liked them! Love the idea of BBQ and mozzarella too! We loved them! Thanks! The BBQ and mozzarella was great, too. We had both to please everyone at the table. my husband wanted pork chops, and i am so sick of our typical brown sugar, apple, pineapple, Worcestershire, etc recipes. YOU ARE A GENIUS. finally a way to spice up a dinner staple.. literally! thanks :)i am making this as we speak, but i know it will be fantastic because you really cant go wrong with cheese and buffalo sauce, ever. We used Franks Red Hot and put blue cheese on them. WOW! We have already talked about variations on the sauce and cheese. Thanks for a great recipe! Yum - I haven't tried blue cheese!! I know - there's really no way you can go wrong with these. Thanks for sharing! 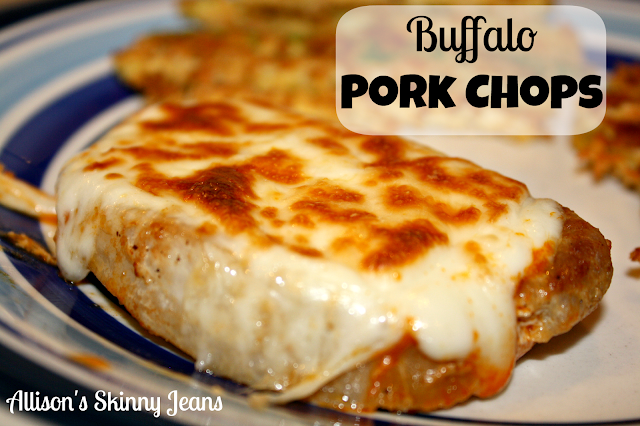 Made this tonight with BBQ sauce and it was a huge hit! Delish! Thank you for sharing. Nice to have a spin on pork chops. Glad you enjoyed it! We love doing it with BBQ, too! I made this for my boyfriend and I and he loved it! I was contemplating on trying the same thing but with chicken. Do you think it would be the same? I have never tried it with chicken, but I'm sure it would still be delicious! You may have to cook it just a little more. Let me know how it turns out! I am pretty sure I used one called Moore's. I would just go easy on the sauce and not use very much the first time you make them. I am not a huge spicy fan - but I could handle the slight kick from these. I put extra on them before I put them in the oven - maybe skip that step. I am making these for dinner tonight. Going to be using Kansas city BBQ sauce with the Mozzarella! I'm excited to try them! I made these tonight. I knew I'd like them, but I have one picky husband! He thought they were delicious! He even wants the leftovers for lunch tomorrow. Such a nice change from your typical pork chops. Thank you! These are wonderful just as suggested!! I've made them 3 times and they always turn out GREAT!! having them again tonight.